A ticket redemption machine. The cabinet has three LED numbers which rapidly cycle between 0-9. The player must press the "Stop" button to stop each number, and are awarded tickets based on their result. 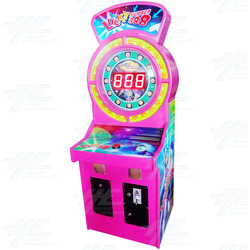 If the player manages to stop the numbers at "888", then they will win the jackpot.